Harnessing the power of machine learning and collaborative predictive data analytics is key to improve prediction of equipment failures and optimise predictive maintenance strategies. The overall goal of this project is to improve predictability of faults on complex engineering equipment such as turbines and engines, which will then enable the manufacturer of such equipment to improve the service provided to their customers. This will also lead to the reduction of unplanned failures and service disruption. In particular, this project will focus on the development of reference implementations of prognostics systems and methodologies, which apply modern statistical or machine learning techniques or technologies for the early detection of any fault modes for equipment based on vast amounts of sensor data, event logs and maintenance history records. We developed an algorithm to combine multiple sensor data and event data to create labelled data for testing. Using natural language processing techniques, we analyzed the characteristics of fault messages for specific components. Keywords were extracted from message logs and the temporal information of failure messages were recorded. To improve data quality, we identified a time window to reduce interference of maintenance events on sensor data. To improve the performance of prediction and reduce the computational burden, we segmented the data based on the value of time-to-failure with a moving time window. 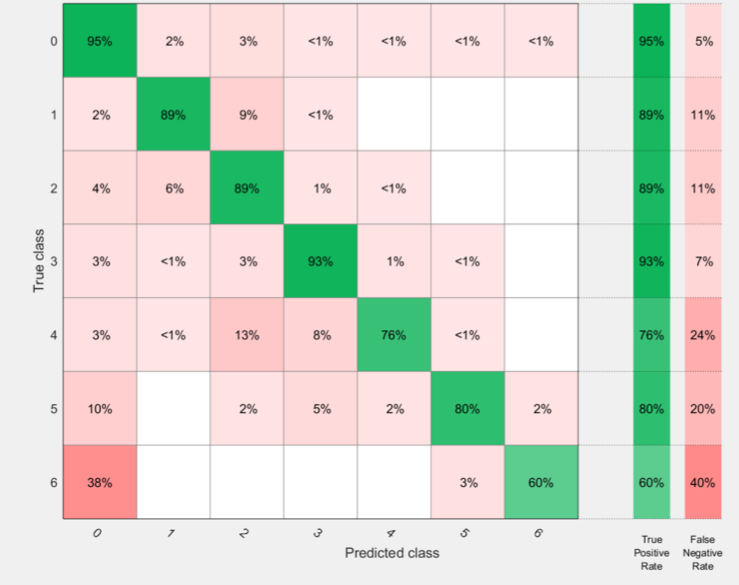 Through this, we converted the prediction problem into a classification of discrete stages. The labelled data was tested with multiple classification algorithms and the best-performed algorithm was selected. This approach was used to train the prediction model with data from a fleet of machines and the output of the resulting model was tested and validated. We were able to achieve an accuracy of up to 93% for predicting the failure of some components within a machine. The figure below shows the confusion matrix that summarises the accuracy of failure prediction. Aremu, O., Salvador-Palau, A., Hyland-Wood, D., McAree, P.R., Parlikad, A.K., “Structuring data for intelligent predictive maintenance in asset management,” In Proc. 16th IFAC Symposium on Information Control Problems in Manufacturing (INCOM), Bergamo, June 2018.